Gulfside Villa is a rare, 8-unit low-rise condominium located directly on the sparkling Gulf of Mexico with a private patio overlooking Perdido Key's beautiful blue waters and sugar white beaches. This beachfront bungalow is a short walk up to the top floor where the west end location has the most amazing views! We're not sure which you'll love more--the balcony views or the incredible modern renovations and furnishings completed in early 2018. The owners thoughtfully decorated for your comfort and enjoyment. This condo is truly a little slice of beach paradise. Everyone was amazing! Very kind and helpful. I LOVE this property. 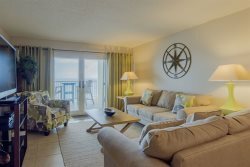 Ive stayed at several different locations across perdido key and I will definitely be staying at Gulfside Villa 2D again. I was extremely impressed with the new remodel and furniture. The whole condo felt like a brand new home. This condo is a gem and I cant wait to vacation in it again! Again, great stay except for sharing the public beach.